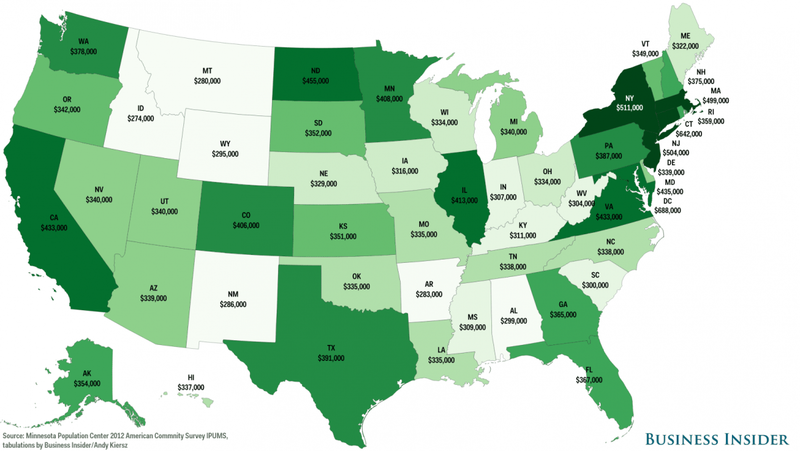 Business Insider released a U.S. map with rough estimates of what income a household would need to earn (rounded to the nearest thousand) in order to be in the top 1% of the income distribution in each state. The results are surprising to read; when I think one percent-ers, I think of Daddy Warbucks. I think of the idle rich, private planes, beach houses, lunch in Paris and four day weekends. According to Business Insider in Texas, a household would need to earn $391,000 to be the top 1%. Now, that's a tremendous amount of money, but if the income is earned from a paycheck, then the 1% still has to get up and go to work every day. It's a lot less exciting than I thought. Another data point in the article that is important to note is that in Texas the 2012 median household income is $50,740, which means if your household earns $51,000, then you're in the top half of income earners in Texas. I keep thinking we cannot afford children, but based on these facts there is a state full of people raising families on a lot less money then we earn each year. My husband's mother's bestie June told us two years ago: "you will never think you can afford kids, but once you have kids it'll all work out..." She then encouraged us to trash our financial model. Few people wait until everything is perfect to add a child(ren) to the family. If they did, we would have a lot fewer kids. Plus, who could even guess how many children came along that were surprise pregnancies? So just go for it. There could not be any better parents than you two. Look at your brother - he is unbelievably great Dad. So quit depriving your children of getting to be with you sooner than later. (I was 24 and 26 when I had my you two. And at 24, I knew absolutely nothing about babies, nothing. You teach yourself, you read a bit, you listen and observe other children, it is not hard to learn, it is very natural. You are so much farther along than 99% of new parents, maybe even 100%. And when they first come, remember all you have to know is how to take care of an infant. It's not like you need to know how to handle a teenager as soon as they arrive. A child growing up is actually a pretty slow process. You have plenty of time to get comfortable with the different stages before you ever get there. Love you!! When I look at your map, I quickly notice that the highest 1% marker is in DC. Is it just me, or does it seem ominous that the city of highest level government officials mixed with lots of influence peddlers boasts the highest income level in the country... by far! ?